The sales tax holiday was nice, but Wisconsin Republicans could have helped consumers so much more by repealing the Minimum Markup laws and letting the invisible hand work. Their failure is not inexplicable, but very disappointing. MacIver runs some numbers. The MacIver Institute is on the case. 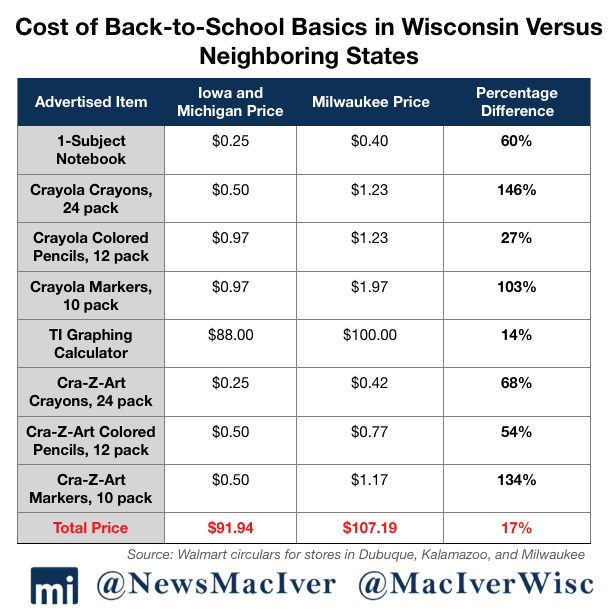 The MacIver Institute recently completed its annual investigation into potentially illegal Black Friday prices in Wisconsin. We reached the conclusion that once again, a crime wave of illegally low prices will sweep the state this holiday shopping season thanks to Wisconsin’s antiquated minimum markup law. Across the state, retailers like Toys”R”Us, Walmart, Target, and countless others are offering deals so good, they must be illegal under the minimum markup law. Formally known as the Unfair Sales Act, the minimum markup law was enacted in the Great Depression – a time when Amazon was just a river in Brazil. The law requires that alcohol, tobacco, and motor fuel are marked up 3 percent at the wholesale level and 6 percent at the retail level for alcohol and tobacco, and 9.18 percent at the retail level for motor fuel. It also forbids retailers from selling most other products below cost. Many of the discounts retailers are offering on Black Friday likely run afoul of the Unfair Sales Act, but the law is only selectively enforced. It’s ridiculous to have such a law on the books. [Madison, Wisc…] On Tuesday, Sens. Vukmir and Craig and Reps. Ott and Murphy introduced a bill to repeal portions of Wisconsin’s antiquated Unfair Sales Act. Also known as the minimum markup law, the Unfair Sales Act mandates higher prices and outlaws the sale of retail goods at below cost. The minimum markup law requires that alcohol, tobacco, and motor fuel are marked up 3 percent at the wholesale level, 6 percent at the retail level for alcohol and tobacco, and 9.18 percent at the retail level for motor fuel. It also forbids retailers from selling most other products below cost. The Unfair Sales Act is a depression era relic of big government protecting the profits of businesses by limiting competition. The whole thing should be tossed into the dust bin. This is not the first time a bill to repeal some or all of it has been introduced and every attempt has failed. Why? Because there are a lot of Wisconsin businesses who like the law because it guarantees them a minimum level of profit and prevents their competitors from beating them on price. Who loses? Consumers who pay unnecessarily inflated prices. This time it looks like Vukmir and Ott have limited the repeal to only cover alcohol, tobacco, and fuel. I assume this is an attempt to reduce the amount of opposition to the bill from the retail business lobby. Unfortunately, I don’t think it will work. Those same lobbyists will fight this bill because it would open up a crack in the law that could be expanded in subsequent sessions. I completely support this bill and encourage my representatives to do the same. The Wisconsin Institute for Law and Liberty is representing the Krist Oil Company in a challenge of the state’s Minimum Markup Law, also known as the Unfair Sales Act, which stops businesses from charging a price less than what they paid for most goods and requires that gas, alcohol, and tobacco products be sold at above cost. Critics of the law claim it violates free market principles by forcing consumers to pay more than the competitive price, while its defenders argue it protects smaller businesses from being priced out by larger competitors. WILL general counsel Rick Essenberg said the law is based upon an “antiquated economic theory,” and that consumers are already protected by state anti-trust laws. “The notion that consumers are somehow served by paying prices that are higher than they otherwise would have to pay is simply implausible,” Essenberg argued during a call with reporters Tuesday. Of course, it would save a lot of legal time and expense if the Republicans would get off their duffs and repeal this stupid law. They should have done it years ago. With all of the good things this legislature has gotten done, it’s a crying shame that they caved to lobbyists over the interests of Wisconsin consumers on this one. The sponsor of a bill to repeal Wisconsin’s Unfair Sales Act, which bars retailers from selling products for less than their cost, said lawmakers are not prepared to pass the measure in 2016. State Sen. Leah Vukmir, speaking to radio host Charlie Sykes on Friday, said she’s “a realist” about the bill’s near-term prospects as lawmakers enter the closing weeks of the 2015-2016 session. Vukmir, R-Wauwatosa, said she’s shifting to “educational mode” to foster support for the bill in future sessions. “There isn’t enough support in the caucus to repeal” the law, Vukmir said Friday. The act, also known as the minimum markup law, prevents Wisconsin wholesalers and retailers from selling products at less than cost. It also requires retailers to impose a minimum profit markup on certain products, such as fuel, tobacco and alcoholic beverages. Wisconsinites will spend millions more than their neighbors on goods because Republican lawmakers can’t overcome their fear of the grocers lobby. What is even more frustrating is that none of the opponents will actually offer a defense of this ridiculous law. Instead, they hide in the shadows and the leadership is too polite to call them out by name. Wigderson has the details at Right Wisconsin. Well, there is progress of sorts. After some embarrassment for legislative Republicans, the bill to repeal the state’s archaic minimum markup law, ironically known as the Unfair Sales Act, finally has a number and was sent out to committee. SB 371 is now going to the state Senate Committee on Economic Development and Commerce chaired by Senator Rick Gudex. Now the question becomes whether legislative Republicans will develop a spine and allow a public hearing to be held. They will have to risk upsetting the Wisconsin Petroleum Marketers and Convenience Store Association and the Wisconsin Grocers Association, because heaven forfend that these two special interests be made to defend the concept that higher prices are somehow good for consumers. This law needs to be repealed. It would be a serious disappointment if the Republican legislature and the Republican governor won’t get it done. It is always exciting to see new businesses move into Wisconsin. Meijer, which is headquartered just across the lake in Grand Rapids, is moving aggressively into Wisconsin. Four Meijer Supercenters are already open and several more are planned — including a massive, morethan 192,000 square-foot store in West Bend. But Meijer is finding that some of Wisconsin’s antiquated and anti-free market laws are threatening its growth. The communities in which Meijer is building new stores in southeast Wisconsin is already saturated with grocery stores. Meijer is moving into those communities knowing full well that they will have to compete in a market where supply is already ample. As such, virtually all of the business Meijer plans to attract will have to come at the expense of already-existing grocery businesses. This business plan is not unique. Many businesses begin in already-mature markets and do quite well. One of the ways Meijer plans to grow their business is to attract consumers with lower prices. It is a tried-and-true technique to gain market share. But therein lies the rub. Some of the prices that Meijer is advertising for their goods are less than their cost. That act violates Wisconsin’s Unfair Sales Act, more commonly called the minimum markup law. Wisconsin’s minimum markup law became law in 1939 during the Great Depression as part of a spate of reactionary, anti-free market laws passed by the legislature. It essentially mandates that all businesses sell their products at a certain markup over their cost. The stated purpose of it is to prevent businesses from selling a product at below cost, thus driving other sellers of that product out of business. Then, so the logic goes, the business that was selling the product below cost will jack up the price and gouge consumers. Advocates for the minimum markup law contend that it ultimately protects consumers. The problem with the advocates’ logic is that it never happens. Wisconsin is the only state in the nation with a minimum markup law — none of the other 49 states have a problem with that theoretical outcome. Instead, what happens is that when a business begins to gouge consumers with inflated prices, other businesses take advantage of the market opening to move in. In other words, in a free market, the laws of supply and demand rule to regulate prices, if only the market is kept free. There have been attempts over the years to repeal the minimum markup law, but even in a Republican Legislature those efforts have failed. The reason is as simple as looking at who benefits from the law. Existing business interests benefit from the minimum markup law because it inhibits new entrants to the market from competing on the price of goods. In West Bend, for example, existing grocery stores are thrilled that the minimum markup law will prohibit Meijer from attracting customers with lower prices. The minimum markup law is a protectionist racket that insulates existing businesses from competition. On the other hand, it is the consumers who lose with the minimum markup law. Instead of lower prices caused by competition in a free market, consumers are forced to pay unnaturally inflated prices in order to protect the very businesses that are charging them those inflated prices. The time has long-since passed for Wisconsin to repeal the minimum markup law. There is still work for the legislature to do this year and repealing the minimum markup law needs to be near the top of the list.